Here’s a great article that went up on Supporters not customers’ homepage yesterday. It’s about the match between Trafford FC and FC United of Manchester and about how a non-league day out could give more joy than a visit to a giant showdown such as Manchester United – Chelsea. It also sums up a lot of the great things that FC brings to life. “This is a club which is truly united, where the fans still matter and aren’t simply financial commodities to be milked for all they’re worth. If you’re all a bit disillusioned with the state of football in England, embracing FC United may just be the best thing you ever do. Put your doubts to one side and forget who the fans used to support, this isn’t Manchester United. It’s much, much better than that. This entry was posted in English, FC Articles by Linus Lind. Bookmark the permalink. 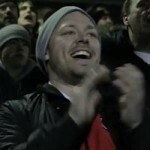 Linus lives in Uppsala, Sweden and attended his first FC United-match in 2009. He then called his father back home to say that "This is what real english football culture sounds like". Ever since then FC United has been a progressively growing drug and Linus is trying his best to spread the word of the "FC United way" both in Sweden and internationally.